Why leave art to the visual artists when you can get sonic stimulation with your eye candy? 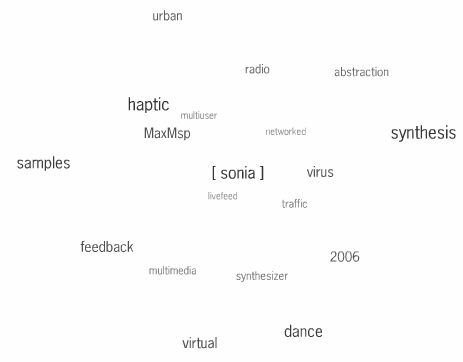 Curate your own sound art exhibition on your browser with the new soundtoys.net site. Thanks to a tagging scheme (a la del.icio.us), you can quickly navigate to artworks and even pull together your own themed show. For a real art opening experience experience, though, I suggest you buy some cheap wine and cheese cubes and invite unshaven friends wearing vintage. And because it’s a sound art exhibition, you can leave out the lame DJ. Chris O’Shea has a superb write-up with background on the project and collective. If the online experience feels a little hollow, Chris says to watch for an in-the-flesh appearance at the upcoming Cybersonica fest in the UK. I love the community sound artwork idea. Anyone here got work in there, or pieces you especially like? Don’t be shy; hit comments . . .
Now I’m back to flying around the cloud o’ tags (shown below).